I missed the memo about having to buy a cool shirt in order to attend the Hunger Games movie. I guess I'll be team Ralph Lauren. He must have been one of the tributes that died right away? 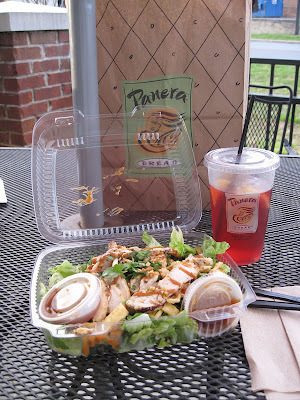 Anyway...Thai Chopped Chicken Salad. Spicy peanut sauce, cilantro, chicken breast, roasted carrots, roasted peppers and edamame. Salad for dinner on a Friday night was a little too virtuous so I was ready for something more indulgent. Red wine and chocolate sounds good, right? How about together? Not so much. Has anyone ever tried this before? It boggles. This morning I had one of my favorite workouts of late - a circuit workout with Tim. I spin for ten minutes while he runs, and then we do ten minutes of : push-ups, planks, crunches, teasers, side crunches, tricep dips, bicep curls and back rows. Then repeat times three. I'm always exhausted at the end but having Tim watch me makes me work harder. I don't know if those arm workouts are working but tonight I could barely stir the batter for the brownies I made (in the oven...smell so good) so I guess it's doing something. Chocolate red wine = awesome combination or gastronomic travesty? Blech. Just no. What's wrong with a glass of red wine with chocolate on the side? WHY???! Do you wait for brownies to cool before cutting and serving? Be honest. Never. I hate that they put that on the box. I have to ate least scoop out one corner with a spoon while the rest cools. No that ChocoVine is delicious! Honestly! It kinda tastes like Baileys and not at all like wine! I always buy some at Christmas for my family. The chocolate raspberry flavor is awesome too. Now you are gonna make me want to run to the Wine Chalet in town here to buy some! I saw the movie last night at midnight - on my husband's request. It was awesome! LOVED it, but am waiting patiently for everyone to see it! I've never had Chocovino, but that Relax Riesling next to it is my FAVORITE! No chocolate wine for me! I'm not going to see Hunger Games until next week and it's killing me, I can hardly wait. 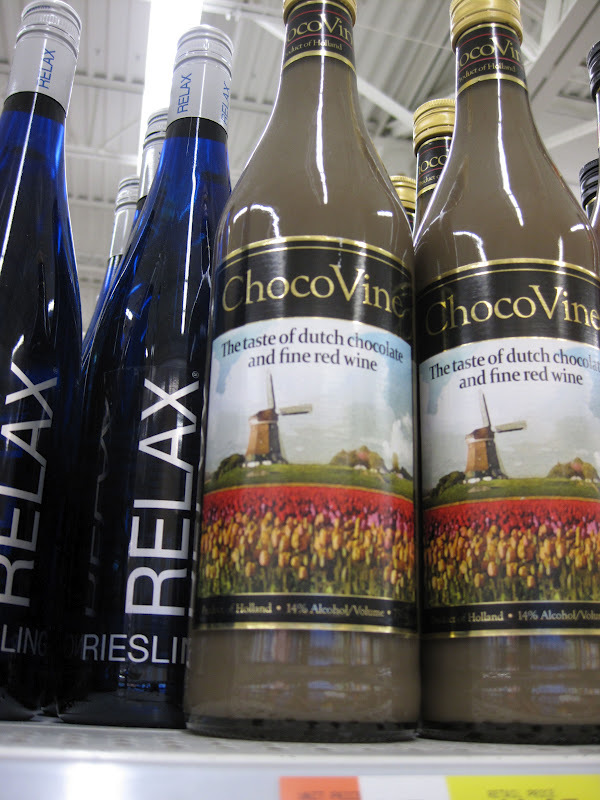 That chocolate wine looks like they bottled sorority girl vomit. I loved Hunger Games. Except for the other people in the theater. I really need to be rich enough to not have to watch my entertainment with the ignorant masses. I actually bought some of that Chocovine last Christmas. I was not a fan, although my sister liked it. That Chocovin sounds gross. I might try a sip if someone around me had it, but I wouldn't buy it. I just tried chocolate wine last weekend and it was pretty good. Not the strawberry or raspberry kind, just plain, but I did like it. I could only have one glass though. You made the wrong choice, I've had that chocolate wine, and it's unbelievably delicious. I want some right now, in fact. We went to Panera too, but we snuck it into the movie theater for lunch yesterday. Classy all around. Ewww. I have a few friends who love that chocovine, but I think it is nasty. Give me straight up red wine and some dark chocolate on the side, please. My favorite food pairing used to be a nice full-bodied red wine with a rich dark chocolate... but yes, on the side! At our house brownies are normally gone before they have a chance to cool! ChocoVine is probably either really good or really bad and I'd hate to ruin my love for red wine by taking a chance so I'll just have my chocolate on the side! Wait, you're supposed to cook brownie batter? I eat it like soup. OHH that wine - do I know ALL about that wine. 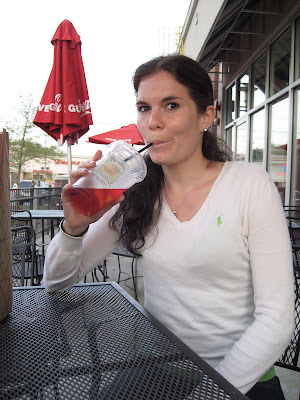 I tried it at a fru fru wine tasting event and LOVED IT! OMG I couldn't drive to the big city fast enough to buy my own bottle. I told my husband about how awesome it was. Got it home - chilled it and was soooo lover the moon about having a glass. I poured my husband and I a large wine glass full of it - WTF - HORRIBLE!!! How could that be? Here's what I've come to find out about that wine (at least it's true for my cards gal pals and my husband) . . a little (i.e. a shot glass full) AWESOME - a bigger serving BARF! You REALLY should give it a try - but sip in small amounts (seriously, my cards friends and I do "shots' of it using fun shot glasses). It's awesome! I am NOT a fan of that wine. My MIL got it a few years ago and I found it vile. But that's not really a flavor profile I like anyway. I like bold, spicy wines. But I hear almond champagne is fantastic. This sounds hiddy as well, but worth a try? I never tried that wine since I am still an Arbor Mist girl. LOL! Well I haven't been either for MONTHS now. Well thank you from one of three people (myself) that have not seen the movie yet for not spoiling it! I can't wait to see it! But I promised my sister that we would go together and she is out of town this weekend and we are both out of town next weekend, so it seems Easter weekend we will be going to see it. I have read the books and they are amazing so I have no doubt that the movie is going to be AMAZING! I saw the movie last night and didn't dress up either. I don't think anyone in the theater was (except for some strange kid wearing a full suit, but I don't think that counts). i saw the movie last night too! Soooo good! I kinda want to go see it again. And I'm with you on the chocolate wine, double yuck! I'm seeing The Hunger Games tomorrow. Can't wait! I'm almost through the second book right now and it's crazy good too! I would have gone with the Relax Riesling instead. That stuff is like Koolaid delicious! I have not seen hunger games yet - I want to but I am waiting for my friend to finish the book. I love warm brownies with ice cream. I sometimes reheat my brownie (or apple pie too) and then add ice cream. SO good. I have had chocolate wine before and liked it, but I think it's like most wines - they don't all taste alike and some are better than others. Seeing Hunger Games tonight and can't wait! I actually have tried that chocovine and it was delicious - it tasted like the godiva chocolate liquer, but a little more strong. I also did the same thing about having to hold my pee that last half of the movie so as to not miss anything - I love, loved it!